The little gospel promises me personal salvation and eternal life. But the robust gospel doesn't stop there. It also promises a new society and a new creation. When Jesus stood up to read Isaiah 61 in the synagogue at Nazareth, then sat down and declared that this prophetic vision was now coming to pass through him, there was more than personal redemption at work. God's kingdom, the society where God's will is established and lived, was now officially at work in his followers. That society was overturning the injustices and exclusions of the empire and establishing an inclusive and just alternative. Luke sees the Christian life as an alteration of two activities, prayer and kindness, each feeding the other. The plight of those in need sends me to prayer; prayer strengthens me to help those in need. But for Luke there is one thing that can make a Christ-like life impossible...wealth. As I have been contemplating what it means to be people who live out the "Jesus Creed" of Love of God and Neighbor, I have also been reading my way through Thomas Cahill's Hinges of History series. I am currently on the book about the impact of Jesus on western civilization, called The Desire of the Everlasting Hills. A history of the social impact of the life of Jesus. 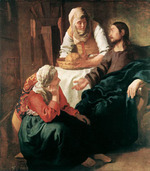 While numerous sermons (including my own) have chided the all-too-busy "Martha-like" person for being so concerned with the things of the world and missing the chance to sit at the feet and learn from Jesus like Mary does, Cahill points out that the placement of Martha and Mary after the Good Samaritan, and before the teaching on prayer leads to a much clearer principle for living the Christina life. This paragraph, read today at the end of a week where our church has gone through a Scripture Vigil (literally hours of "sitting under" the Word") and have been prayerfully considering how God wants to use our sacrificial giving of our wealth to strengthen our ministry to our neighbors, I have been more aware than ever that we are culture of "Marthas" who are pulled by the demands of the world, our fretting about wealth and security, and our desire to live a life that is good, reasonable, practical and comfortable. While those who have prayed, worshiped and read the Scriptures have found their hearts filled with peace and generosity, many more have been unable to take the time to sit in a quiet sanctuary and read the scriptures, or attend a prayer service. As a church and a culture, I am more aware than ever of how we who long to practice kindness, need more and more prayer, to enable us to genuinely love our neighbors. And how kindness and prayer are more difficult for the wealthy than most of us ever imagine. “Teacher, which commandment in the law is the greatest?” Jesus said to him, “ ‘You shall love the Lord your God with all your heart, and with all your soul, and with all your mind.’ This is the greatest and first commandment. And a second is like it: ‘You shall love your neighbor as yourself.’"
Matthew 22:36-39, what Scot McKnight has called "The Jesus Creed." Scot McKnight, Jesus Creed, 127. 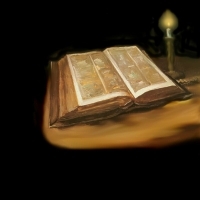 "I kept steadily to meetings, spent First-day afternoons chiefly in reading the Scriptures and other good books, and was early convinced in my mind that true religion consisted in an inward life, wherein the heart does love and reverence God the Creator, and learns to exercise true justice and goodness, not only toward all men, but also toward the brute creation; that, as the mind was moved by an inward principle to love God as an invisible, incomprehensible Being, so, by the same principle, it was moved to love Him in all His manifestations in the visible world; that, as by His breath the flame of life was kindled in all animal sensible creatures, to say we love God as unseen, and at the same time exercise cruelty toward the least creature moving by His life, or by life derived from Him, was a contradiction in itself." 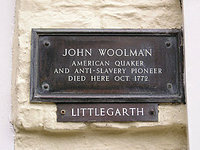 John Woolman, Quaker leader and early abolitionist, 1720-1772. "To sacrifice something is to make it holy by giving it away for love." Rowan Williams, Where God Happens, 27. Another snippet from a book on the Desert Fathers by Archbishop Rowan Williams has triggered another round of obsessing about the "Jesus Creed" of loving God and neighbor: “Have I got this all backwards… again?” Williams definition of a “healthy church” has the requisite “love God” and "love neighbor" that certainly squares with the core teaching of Jesus. But he offers a most challenging twist on the usual order. Most of us say, “I’ll first love God and then look out to my neighbor.” That is, that after I am “prayed up”, “spiritually centered”, have a great "experience" of worship, feel "inspired" and "connected" to God and have had my fill of the Lord’s Supper or the latest praise band, I will then take my spiritually-sated self out into the world and see what I can do. But Archbishop Williams turns the statement on its head. And then offers a most unexpected action step. Then, the unexpected action step. We “convert one another by our truthful awareness of frailty.” Most of us think that if we are going to “convert” or “win” others to God then it will only come as we are “convincing”, “winning”, “attractive” and “strong” in faith and belief. 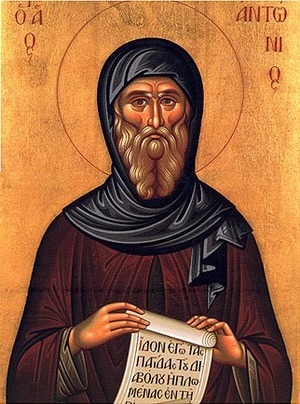 But Williams tells us that as the Desert Fathers fled to solitude, they discovered the depths of their own sin, their own immeasurable need for God, their own weakness, frailty and inability to truly love their neighbors (why else would they become recluses, no?). And as they developed and shared a “truthful awareness of frailty”, they revealed the God they had found. This is a far cry from the way most of us go about “doing church”, “arguing for the faith”, “converting” or “convincing” others. I thought about this last week with the passing of Jerry Falwell. How much more “moral” would our country had become if there was a group of Christians who freely admitted that we are the “Immoral Majority”. That is, that we are sinners, we are scared, we are prone to fight and bicker and judge and pull away and live alienated from each other and so we need desperately to pray for spiritual and political leaders who will--because they live with “truthful awareness of frailty”--do everything they can to work for a just, compassion and moral society. As I sit with more and more people who are feeling disconnected from church and disconnected from God, I am a beginning to wonder if we have the whole thing backward. Maybe we’ll find God and a healthy church the more we “we seek to stay connected with God by seeking to connect others to God” through truthful awareness of frailty both in ourselves and in our world. 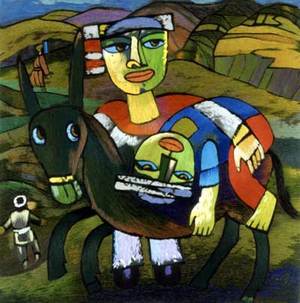 This picture of the Good Samaritan by Chinese artist He Qi adorns our sanctuary walls during our series on "For Love of God and Neighbor". At the same time, I have been learning new insights on love of neighbor from a most unlikely source, the Desert Fathers. "The Monk must die to his neighbor and never judge him in any way whatsoever." Abba Poemen, 4th century Desert Father. Who is the Neighbor you need? In Luke 10:25-37, we have one of the most famous stories in human history. It is arguably, along with the parable of the prodigal son, the most famous parable of Jesus. It has been told in innumerable Sunday School classes. And indeed, the phrase “Good Samaritan” is now a label in our culture for anyone who lends a helping hand. There is even a “Good Sam” club for RVers who are dedicated to helping those who need help along the road. In other words, very few of Jesus’ stories are better known and have made a greater impact than this one. But is that the point of Jesus parable? Let’s state right up front that if all this story teaches us is that God wants people to help others in need, then this is a fine story, a really appropriate and good story and it is worthy of telling to our children and seeking to live out ourselves. If the point of this parable is that we should be willing to do whatever we can to help others, even at great cost. 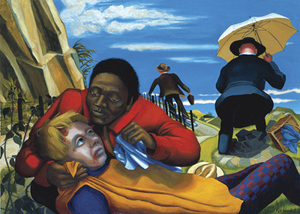 (The Samaritan not only personally took care of the man who was robbed and beaten, but paid the equivalent of two days salary to do so.) Even if this is nothing more than a story about generous, sacrificial, tangible care for others, it is truly a great parable with an important and challenging point. But then we’d miss the actual point that Jesus was making here. And it is even more pointed. Jesus asks him what he thinks the Bible says. The Lawyer responds by citing the same words that Jesus is telling people all over the country side: Love God, Love your neighbor. Jesus tells him, Good, you got it. Do that and you’ll get eternal life. That is, wanting to win the debate and put Jesus in his place, he asks a follow up question,“And who is my neighbor?" The lawyer is asking Jesus, “So who do you say I have to care for in order for God to be pleased with me? Who do I love as a believer who has eternal life? Who is in the club, Jesus? By now, everyone there would have caught the sub-text: What group are you in, Jesus? Who is right? What camp has God’s blessing, in your opinion? Who am I responsible for? And who can I ignore because they are not worthy of my love, they are outside of God’s love, they are wrong, immoral, illegal, irreligious? What do you say? But this is what we most often miss in this story: Jesus’ parable turns the question on its head. Jesus doesn’t directly answer his question. He reframes the entire question from a different perspective that highlights human solidarity, not ethnic and religious division. Jesus’ famous parable begins with an interesting twist that most of us fail to see: Jesus puts the scholar in the position of the victim. And doing so, makes Jesus agenda for changing the whole world more clear and more urgent. Jesus is saying that it is a waste of time and it makes the world a worse place if we spend our time trying to figure out if “they” are part of “us.’ Indeed, if we are to act like Jesus and live out the Kingdom of heaven, then we don’t even think in terms of “us” and “them.” And even more, in a world where at any moment, anyone of us can be in need, we all need a neighbor. When all it takes is one corrupt CEO to wipe out retirement account, one tractor trailer on a freeway, one bad diagnosis, one act of terrorism, one stray bullet, one wrong turn into a bad part of town to wipe out all we know and love, we all have need and we are all a neighbor.